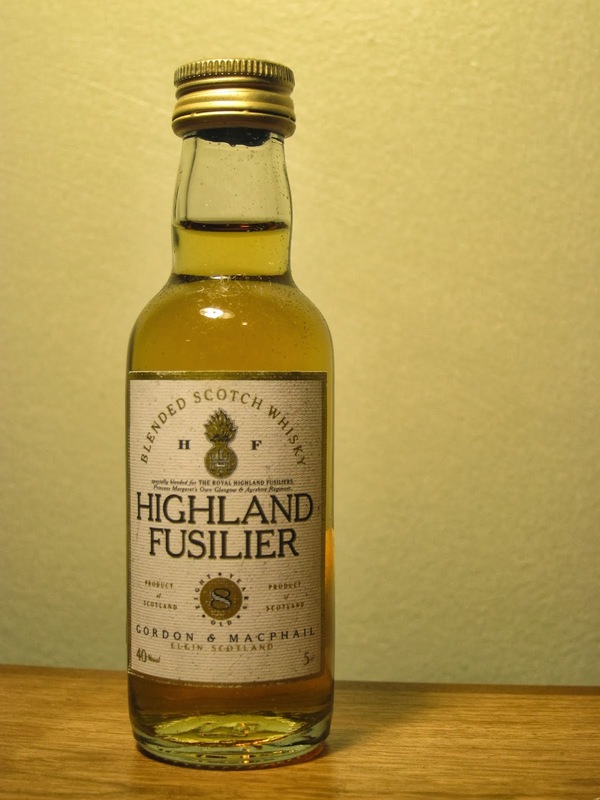 Highland Fusilier (40.0%) : A blended whisky from Gordon & Macphail which is very hard to find any info about online. It almost makes you think that they are not so fond about it. It has an age statement of 8 years which actually makes it look way more fancier than any other blend in Blend Project. On G&M's site it is also mentioned that the whisky is matured in refill sherry casks. Anyway I have a great confidence in G&M and looking forward to taste it... Color: Light amber, with surprisingly distinct legs. Nose: Nice vanilla aromas, hard wood shavings, and furniture polish. Baklava syrup, cloves and cinnamon. Pretty satisfying. Adding water pulls it to the grassy side: Dandelion and rocket leaves, capers and hint of wine vinegar. Palate: Wait a minute, we have something pretty good here... Creme brulee, sticky toffee pudding and Mexican coconut flan with a whiff of sweet smoke. Cold pear compote, honeydew slices and sweet paprika. Water elevated all the sweet notes from sherry casks. Syrupy middle eastern desserts, milk chocolate with whole hazelnuts, cracked white pepper corns and maple syrup. Finish: Miles longer than you would expect from any blended whisky at 40% abv. Full force with cloves, cinnamon and sugar burn. Overall: This was such a nice surprise! We might have a winner here. It's a great blend in its price category. I cannot imagine anybody complaining about anything after sipping this whisky. Very well balanced, incredibly smooth and rounded. I would bet that the formula has a healthy portion of Benromach in the recipe. I could taste it very clearly. Too bad that we don't have it in US. It could be easily my to go blend. If you see it somewhere on the shelf definitely give a chance. You would agree with me... Thanks again to Stephen Mathis for the sample. You rock!